Please consider writing our health ministers regarding the new legislation around Opioid prescriptions and its impact on Chronic Pain patients. Below are letters you can print off and use. 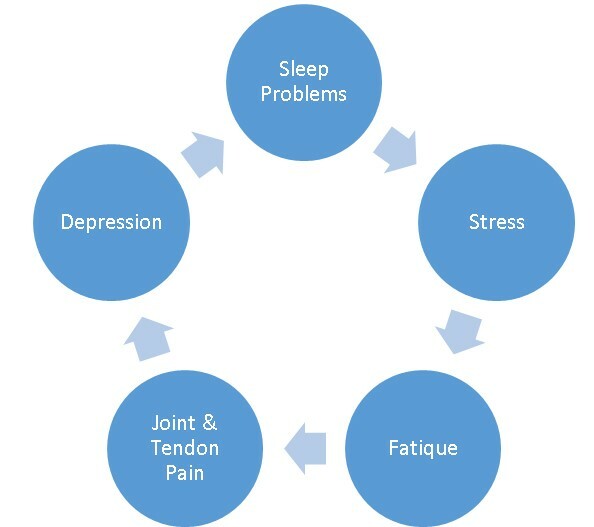 This is Fibromyalgia, a vicious circle that appears to have no ending. There are of course other symptoms thrown in there like morning stiffness, brain fog, and forgetfulness, you can probably add some of your own little quirks in there as well, I know I can. I was diagnosed with Fibromyalgia 31 years ago and it took them over a year to tell me what was wrong. I had every ex-ray possible and any other procedure that can be done to a person. No one was really listening to me when I said it is not my bones or my organs, “It is my muscles and joint”. I finally came across a Dr. who knew exactly what I was saying and he gave it a name “FIBROMYALGIA” I wasn’t crazy after all. In those 30 years I have taken a number of medications that all go with the name fibromyalgia. Some I left behind and some I have stayed with but I found that the meds are not the answer, they do help but I turned to water. I found that water is the answer for me. At first I went to a couple of aquacise classes and found that I didn’t hurt which was really surprising. I then added a couple more and found I was really feeling good. In the first year I increased my couple of times to 5 times a week and I stuck with it. As you know it is very difficult to stick to a course of action or whatever you are doing until you do stop and find out how much better you “did” feel during that period of time. You realise that whatever your body was doing it was helping with the pain, stiffness, depression and whatever else this syndrome is throwing at you. I cannot stress enough how powerful water is and what it can do for you. I have been doing water exercises for 29 years and I have been an instructor for 23 of those years. I love it and it helps, so if you have the power to do get to a pool and do some water exercises I would advise you to do it, it truly saved my life. It not only helps your body but the friendships you make along the way helps your heart and your mind. Stay strong and healthy, mentally and physically and you are on top of the world. What is Fibromyalgia? Read all about here from the Mayo Clinic. Read the article from the CBC here.